The same year Catherine Booth was dying of cancer in London (see yesterday’s meditation), Methodist pastor Edgar Helms (1863-1942) was beginning his ministry at Morgan Chapel in the slums of Boston’s South End. Poor people often came to his church office looking for food and clothes. They were literally starving and freezing, and he could not refuse them. But he did not know what to do. He could not take care of all the needs out of his small income; neither could his congregation, because most of them were poor themselves. Helms took the matter to the Lord in prayer, and he was reminded of the story of Jesus feeding the 5,000. After everyone had eaten, Jesus sent the disciples out into the crowd saying, “Gather up the fragments that remain, so that nothing will be lost” (John 6:12). “Gather the fragments” Helms kept saying to himself, and he thought about how all the people lived in the wealthier parts of town with all their extra clothes and food. He knew what they had, because that is where he used to live. Helms decided on a plan. Every day he took a couple of gunny sacks and rode the streetcar out into the fancier parts of town. There he would go door to door and tell people about the needy people at his door every day, and about what Jesus said to his disciples in John 6:12. He found that most people had something they could give, and so each day he would get his sacks full and then take the streetcar back to his church. There, he would spread the clothes and food out on tables in the auditorium and invite the people in to help themselves. This, however, created another problem. Helms was disappointed to see how the poor people acted, greedily grabbing all they could, pushing and shoving like wild animals. He learned that for the sake of order and for self-respect, the poor needed to pay something for what they got. And, if they had no money, Helms would put them to work to earn some. Donated items often needed to be refurbished before they could be sold, so women could mend clothes, men could fix furniture, and all could work at stocking and managing the growing inventory. They were then paid (if there was not enough cash, they were given vouchers), and they could use what they earned to buy what they needed. 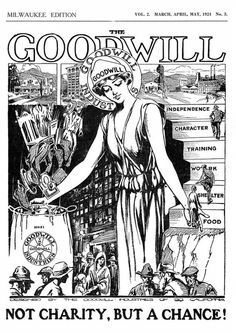 Thus began what is now known as Goodwill Industries. Helms expanded his vision to stores throughout the United States, and then around the world. Today, along with the distribution of used clothing, Goodwill provides disabled and socially disadvantaged people with employment, job training, job placement, and vocational evaluation and counseling. John 6:11-13 — Jesus then took the loaves, gave thanks, and distributed to those who were seated as much as they wanted. He did the same with the fish. When they had all had enough to eat, he said to his disciples, “Gather up the fragments that remain, so that nothing will be lost.” So they gathered them and filled twelve baskets with the pieces of the five barley loaves left over by those who had eaten. James 2:15-17 — Suppose a brother or a sister is without clothes and daily food. If one of you says to them, “Go in peace; keep warm and well fed,” but does nothing about their physical needs, what good is it? In the same way, faith by itself, if it is not accompanied by action, is dead. Almighty God, look upon those who are in need but cannot work, or who lack employment and search for it in vain; on those who struggle to meet exacting claims with inadequate resources; on all who move in insecurity attended by worry or despair. Stand by them, O God in their deprivations and dilemmas, and guide them as they try to solve their problems; let them come to open doors of opportunity or refuge; and so quicken and extend the world’s concern for all those people that everyone maybe ensured a livelihood and safety from the bitterness of want, through Jesus Christ our Lord. Amen.